Jenni created this all-natural facial serum that moisturizes, tightens and firms skin. She uses oils that are full of vitamins, fight wrinkles, firm skin, regenerate skin, heal skin and increase circulation. It’s the perfect blend of oils! This is also an extremely easy mix and use recipe. (Be sure to include the 2 tablespoons of Rosehip Seed Oil. It gets lost above a large ad). Because it’s a serum, apply just a little to your face daily. 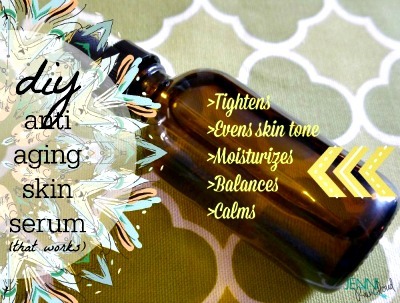 Click on the Homemade Firming and Anti Aging Skin Serum Recipe link below for Jenni’s recipe.